Pumpkins have been filling up our CSA box here at the end of the season, and aside from pureed soups and pies what else can you do with them? Well, pumpkin is squash so you can treat it just like any other squash by roasting, mashing, or sautéing. This week I came across an interesting recipe for sautéed pumpkin and chestnuts which further satisfied my ‘what else…?’ question. It was really an accidental discovery. For some reason my Rôtis cookbook was sitting out in the living room so I picked it up and started thumbing through it looking for a Sunday Dinner idea. While browsing I discovered a section in the back of the book I never knew was there: a chapter on side dishes to accompany all of the roasts. Sorry, I never get past the roasts! Nothing really racy or too fancy but solid plates which would go with roasts. The one which caught my eye was Potimarron-chatâignes, or, pumpkin with chestnuts. Earthy flavors all around with the sweet chestnut meat. Very intrigued. Would definitely be good with a fall roast. While I really like this cookbook, it has excellent idea for roasts, I always feel the instructions aren’t the best. For a more experienced home cook like me it’s not much of a problem recognizing this and making adjustments, but for someone just learning it could be very frustrating. For example, the recipe calls for a medium pumpkin, seeded and cubed. What’s a medium pumpkin? My quibble here is if you have an ingredient which is one of the main components you need a better idea of quantity. Also, I think the cooking times given tend to be a bit off. There are a couple of pork roast recipes where if you cook the roast for as long as they say you’re going to have very dry pork. Good thing we have digital thermometers to help! With this recipe however, the cooking times given were on the shorter side so it ended up taking a lot longer. In the end, the flavors are definitely there and it is a very simple and quick dish to make. It’s just onion, pumpkin, chestnuts, and seasoning. An extremely simple side dish which is an open canvas for you. 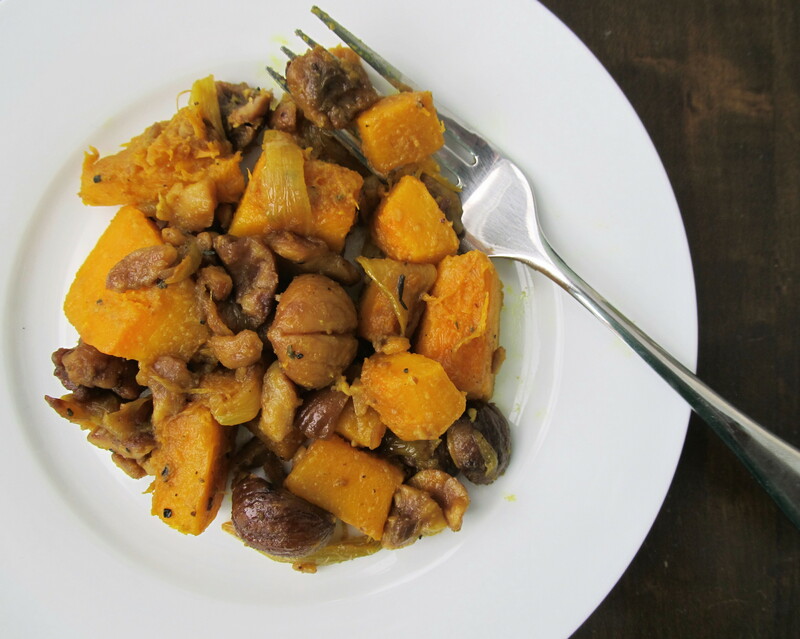 The combo of pumpkin and chestnuts definitely works, and it’s much more savory than sweet potatoes. Given the simplicity, I think it’d make a really good, new and different, side dish for the upcoming Thanksgiving holiday, which by the way is only 3 weeks away! Gobble gobble! Clean out the pumpkin, cut into 1 inch cubes, and slice the outer skin off of the cubes. If you have whole roasted chestnuts break them up into various sizes, keep 1/3 whole, split 1/3 into halves, crush the remaining into smaller pieces. Over medium-high heat on the stove bring a large pot of water to boil. Add the pumpkin cubes and cook until they soften. Drain and set aside. In a large pan over medium heat, add the butter and olive oil. When the butter has melted add the onions and sauté until they begin to caramelize. Add the chestnuts. When heated, add the pumpkin and stir in the turmeric and thyme. Season with salt and pepper. Serve. Very glad to see a savory pumpkin dish, it looks delicious. Pumpkin is underutilized in savory recipes. Very nice, this would be so nice as a Thanksgiving side. Very overlooked, and in such abundance this time of year. More than just a centerpiece!